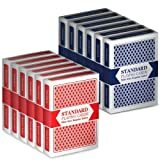 If you play cards often, and all the more so if you play for money stakes, you want to make sure that the deck of cards is shuffled properly. The best method of shuffling is the riffle shuffle, where you divide the deck into two halves, and interleave the cards together. Mathematicians have shown that it requires 7 riffle shuffles to get a deck to be properly random. But that takes some time. Maybe you’ll prefer a card shuffler that can do that for you more easily, will less of a chance of exposing the cards in between. 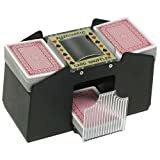 There are manual and electric models, that can shuffle any where from 1 to 8 decks of cards together. Manual: After you place an equal quantity of cards in two separate piles, and place each pile in its individual bin, you turn a crank by hand. The crank admits the cards from each pile in an alternating fashion, effectively shuffling the deck. CHH’s 2 Deck Hand Crank "Welcome To Las Vegas" shuffler is a manual model. Battery Operated: A number of manufacturers sell battery-operated card shufflers, that work on “AA” or “C” batteries. 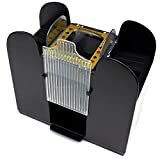 The Brybelly Casino 6 Deck Automatic Card Shuffler uses 4 “C” batteries, and can manage 6 decks of cards in a matter of seconds. Prefer the manual hand-crank: Surprisingly, some prefer the manual hand crank for shuffling a single deck of cards. They display fewer problems of the machine breaking or cards getting stuck, than in the battery-operated version. If a card does get stuck with the manual shuffler, simply turn the crank slowly in the opposite direction, until it frees up. The manual shuffler is also significantly quieter than most electric versions. But the manual version usually can’t handle more than two decks at once. 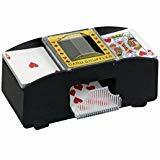 Ideal for people with arthritis: Both the manual and the electric shufflers were a hit with people who enjoy card games, but unfortunately have problems with their hands due to arthritis or stiff joints. A push-button shuffler, or even the manual with the hand crank, does the trick. Number of decks that you can shuffle at once: Maybe you’ll decide on a card shuffler based on the number of decks it can shuffle. Games like “Canasta” or “Hand and Foot” require at least two decks at once, or as many as seven! So it’s good that you get a card shuffler that can help you prepare for that as well. Which games can use more than one deck: Poker can theoretically only be played with one deck, in order to preserve the probabilities of getting each type of hand. But other games, such as blackjack, casinos will generally use several decks, to eliminate the possibility of counting cards. Can shuffle different sizes of cards: A poker deck of cards is larger than a deck of cards for bridge. A poker deck measures 2.5” by 3.5”, while a bridge deck measures 2.25” by 3.5”. There are also varying thicknesses of cards. Check if the shuffler that interests you is able to shuffle different sizes of cards. 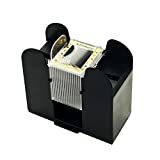 The Brybelly models (for example, the 1-2 Deck Deluxe Wooden Card Shuffler can accommodate both types of playing cards. Some shufflers also work better with plastic cards than with paper cards. Brybelly--was founded by Jeff Smith and Knute Lentz in 2004 in Greenfield, Indiana, as retailers of many brands of products in the areas of games, toys, health and beauty. They sell carnival supplies, hobby games, kitchen utensils, barware, and much more. 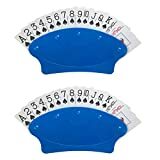 Their card shufflers can shuffle 2, 4, or any range from 1 to 6 decks of cards. 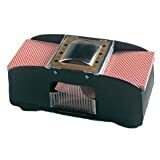 Laser Sports--are makers of the Casino Deluxe Automatic 4-Deck Card Shuffler. They also make a number of sports and fitness accessories such as table tennis equipment, therapy balls and resistance loop bands, and more. CHH--is a retailer of a number of game and game accessories, as well as sports and fitness products. 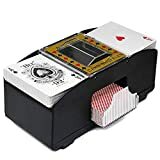 They sell a battery-powered 4-deck card shuffler and a hand-crank manual shuffler, as well as equipment for dominoes, Chinese checkers, chess, billiards, darts and much more. Trademark Innovations--are retailers of games, sports and fitness equipment, as well as patio, lawn and garden accessories. 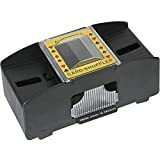 They sell a battery-operated card shuffler that can shuffle a maximum of two decks at a time.